Obama and Economic Recovery | Impossible! 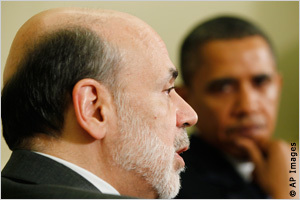 Obama & Bernanke, working for whom? Obama can’t help the economy. Our country is being stolen and he is helping the thieves; he works for them. Wasn’t he going to bring our troops back? He works for them. Didn’t he give the megabanks a bailout? He works for them. Trying to fix our economy with the corporate oligarchy in control, is like trying to fill a bucket which has a hole at the bottom: Impossible! And this hole is a big hole. Our hole is a criminal entity that uses our resources and manpower for their own gain. It is bringing the country down. How can we, or should I say, how can the world trust a government that assassinates suspects instead of bringing them to justice? How can the world trust a government that hides and refuses to see evidence on a crime that killed over 3,000 of its people? AE 9/11 Truth The world is beginning to know. The world is beginning to know that until it eradicates the scum that permeates its governments it is not possible to recover in any way. And the world is beginning to know that our government is the most corrupt of all; their credibility is in fast decline; the tracks left in the wake of their crimes are becoming too obvious to miss. The world will know. The world will know about this entity that operates in the shadows and control governments: the scum of the earth. And then . . . There shall be no recovery until we get rid of the looters. But riots or revolutions won’t work; they will still control the economy. Only a change of consciousness will work. Do we live the right way? Do we actually care for our fellow human beings? Are we up to the challenge?